The Eurasian lynx can be considered quite a secretive creature. The sounds it makes are very low and often not heard, and their presence in an area can go unnoticed for years! Lynx make an unusual range of vocalisations through breeding season; growls, coughs, grunts and meow-like caterwauling, the rest of the time they are very quiet but will mew, hiss, growl, purr and chatter at out of reach prey just as pet cats do. Breeding season focuses on February/March when females come into oestrous for about a week, this is typical of cold weather cats which have their young just in time for spring/summer so they can grow strong before winter. Eurasian lynx will not breed at any other time of year, though occasionally females who lose a litter will attempt a second in April. regnant females find a secluded den and line it with feathers, fur and grasses for warmth and comfort, usually having 2-3 kittens after a 2 month gestation period. Kittens are born blind and helpless, but by 6 weeks are eating solid food and ready to leave the den. They are fully weaned by 6 months and become independent around 10 months, usually breeding for the first time at 2-3 years of age. Big Cat Rescue, one of the world’s largest accredited sanctuaries for exotic cats, is a leading advocate in ending the abuse of captive big cats and saving wild cats from extinction. 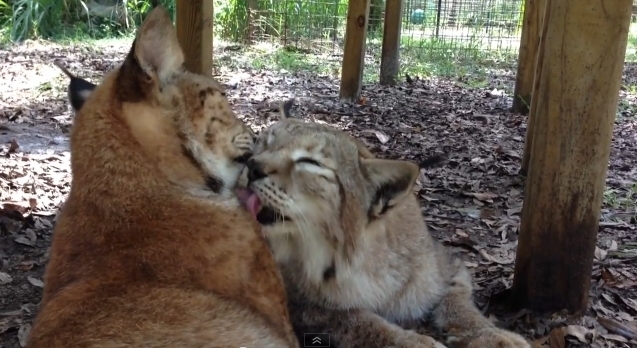 Responses to "Two rescued Siberian lynx love each other so much they can't stop cuddling"